April 22, 2013 By Allyson 13 Comments This post may contain affiliate links. Read my disclosure policy. Around this time of the year, I love shopping for berries at the local Asian Farmers Market. They are so cheap ($1 per container of strawberries), and while they won’t last for days, if you have a recipe in mind they are perfect. I went a little overboard that weekend with my strawberry purchases. We were hosting a brunch and I had decided to make a strawberry danish, and I had also made fresh Strawberry and Basil Margaritas the night before. So I stocked up, and had some left over. With perfect timing, my friend shared a recipe with me for a Seasonal Strawberry Feta and Quinoa Salad. She knows how much I adore quinoa. It looked delicious, and since I had nearly all the ingredients on hand, I decided to make it the next day. While the original recipe called for walnuts, I didn’t have any, so I left those out. It also suggested feta, however I had barely any feta left, but a whole container of goat cheese. I am sure it would be delicious as it was first written, but we absolutely loves the salad with the few modifications…even my husband, who doesn’t usually like strawberries all that much. 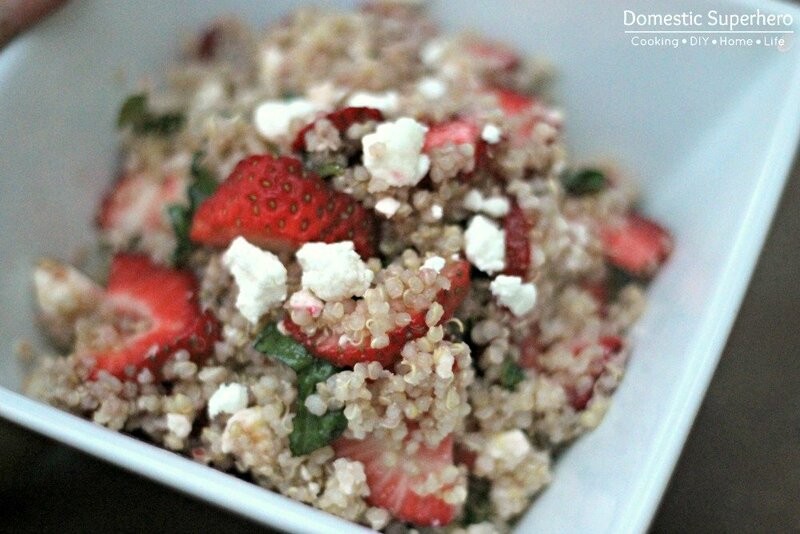 This Strawberry Goat Cheese Quinoa Salad is perfect for summer. It’s light and sweet, and filled with protein from the nutrient packed quinoa. Make this and take it along to your neighborhood BBQ, everyone will be asking you for the recipe. 2. 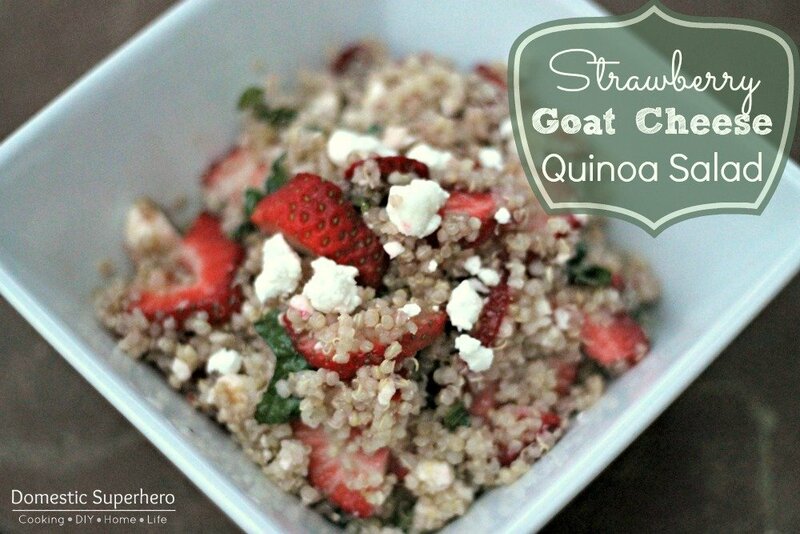 In a large bowl mix together quinoa, sliced strawberries, goat cheese, and basil. 3. In small bowl, mix honey and olive oil with a fork, then drizzle over quinoa mixture and toss. 4. Serve cold or at room temperature. Ok, yum!!! This delicious! It has all of my favorite components. Goat cheese, strawberries, quinoa, and basil. GREAT recipe! 🙂 Thanks for sharing at Monday Funday! It’s so tasty! I hope you try it! Great recipe! Strawberries are my favorite fruit. I’, so glad you linked up at Transformed Tuesday. 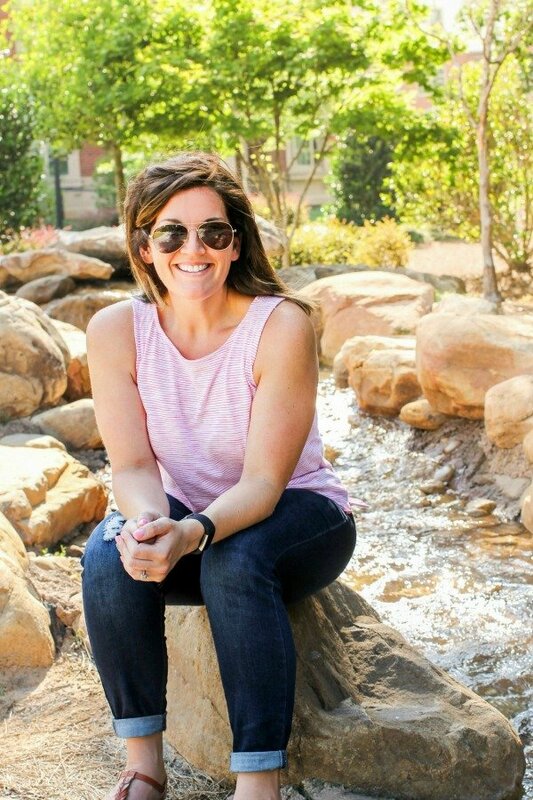 I featured you on this week’s Pink Hippo Party! Thank you!!! I will give you a big shout out on Facebook! Definitely have to get out the quinoa and try this! Looks so great!